The ladies gold Claddagh rings are beloved by many of our customers worldwide. The rings in this collection are made with the finest gold by our expert jeweller. The ladies gold Claddagh comes in many styles and different types of gold. The assortment of rings include white gold Claddagh rings, yellow gold Claddagh bands, rose gold Claddagh bands and two tone gold Claddagh bands.The ladies gold Claddagh ring is the perfect ring for your mom, sister, friend or partner. This ring is truly a gracious gift for the lady you love. The Claddagh ring is a symbol of love, loyalty and friendship. The band has two hands holding a heart with a crown above the heart. Every small detail has a meaning on this beautiful ring. The detail signifies the giving of your heart to someone you love and crowning that love with your loyalty. 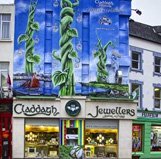 Claddagh Jewellers have been operating since 1967 and are the makers of the Authentic Claddagh Ring™. Your satisfaction with our jewellery and customer service is our number one priority. We are committed to delivering high customer service before, during and after your purchase. We only use the highest quality materials to make our rings to ensure you receive the highest quality jewellery.